Slim, elegant and subtly feminine, Force SaniBins are purpose designed to fit into washroom cubicles of any size. They manage sanitary waste discreetly, safely and responsibly, and with minimum harm to the environment. A vital but unobtrusive presence in washrooms everywhere, Force® SaniBins meet the needs of today’s women by providing a safe and hygienic way to dispose of sanitary waste. Keeps washrooms clean, safe and sanitary. Provides easy access for users. Uses touch-free pedal controls for minimal direct contact. Designed with a deep chute to prevent adhesion and enhance hygiene. Ensures easy access for service hygienists. Includes easy-to-clean body shape, with a smoothness that resists dirt and bacteria. Uses lined dry-system bins, so the interior is never soiled. Please could you tell me how long/wide/deep this bin is? When hands need protection against oils, grease, inks, dry powders, bitumen, water and general dirt .. 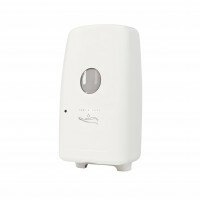 Designed for use with Mode Air Freshener Dispensers, these fragranced refills refresh the room ..